Cilantro – Love It or Hate It? Cilantro is one of those spices that seems to be all or nothing. People generally love it, and can’t get enough of it, or they can’t stand it at all. To a certain extent, that could be said about many things, but in the case of cilantro, your genetics may have something to do with it. The fresh greens of the cilantro plant are used in many foods and recently have become popular in salsas. The seeds, which are better known as Coriander, are also used in many recipes. Even if you are a cilantro hater, as a companion plant, cilantro attracts beneficial insects that feed on other bugs as well as repelling some pests. That’s reason enough to put it in your garden, plus you’re bound to be able to find someone who loves it. For those lovers of all things cilantro, to produce a lush plant, grow it near peas and beans. The nitrogen is well appreciated. Personally, I don’t love cilantro, so adding it to my garden hasn’t been a priority. But I have enough people around me that do love it, which makes growing cilantro worth it to me. It grows relatively easily and doesn’t take up all that much space, so I sneak it in somewhere. Since it germinates slowly, be patient when starting from seed. This entry was posted in Plants and tagged cilantro, coriander, herbs on April 25, 2014 by jeannethro. 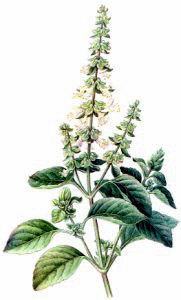 Basil is a leafy herb used in pesto and other italian dishes. It is a good companion plant to tomatoes and is an annual plant that does not tolerate cold weather or frost. More information can be found at en.wikipedia.org/wiki/Basil or myfolia.com/plants/1-basil-ocimum-basilicum/varieties/637-genovese. This entry was posted in Plants and tagged basil on March 24, 2014 by jeannethro. 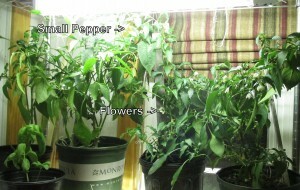 Baby Bell Peppers over wintered indoors. Contrary to popular belief, peppers and tomatoes are actually perennials that we often treat as annuals where frost happens. The Baby Bell Peppers pictured here are from our garden last year. Right now in February there are many flowers and even 1 small pepper growing. Once these plants are hardened outside, we could be getting peppers a month or more earlier than if we started and planted them the standard way. Space is a challenge to over winter these plants, which is why the smaller Baby Bell plants were chosen over the larger pepper varieties. Since tomatoes are also perennials, bringing a few over winter is an option also, however, they’re usually larger, so pruning would be recommended. Also, generally speaking, tomato plants like cooler temperatures (about 50° or so) than you’d normally have indoors. The nice thing about tomato plants though is how easily they can be started from cuttings. So trim those plants and start some more quick for the upcoming growing season. In the end, it’s not necessary to be able to save all your pepper and tomato plants, just a couple to get a head start on your next seasons garden. This entry was posted in Plants and tagged chilis, peppers, tomatoes on March 23, 2014 by jeannethro.